Denver has long functioned as a hub for the Mountain West, first with the transcontinental rail lines linking Chicago and Missouri with California and Texas with the Pacific Northwest, and then with the airlines: United, Frontier, Continental, and Western all built connecting operations there from the 1920s up into the 1970s. The city’s old Stapleton International Airport had to be extended time and again until there was nowhere left to build, and at the expense of operating well in snow and bad weather. Sites to start a new airport were evaluated through the 1980s, and the building process went from 1989 through 1995. Early troubles with the airport’s baggage system and snow removal were resolved, and today Denver International is one of the highest-rated airports in North America with excellent on-time figures. Despite its busy schedule of connecting flights and growing list of nonstops to Europe, Denver did not get a flight to Asia until June 2013, when United launched service to Tokyo-Narita. Part of this is due to the city’s historic absence of Asian immigrant communities: in the 1880s an early Chinatown was destroyed in race riots, and a later version was torn down in 1940 to build industrial space. The Vietnamese community that arrived in the 1970s-80s stayed and grew roots, however, and in the 1990s-2000s global trade and higher education has drawn budding neighborhoods of Japanese, Korean, and Chinese immigrants. Denver’s high altitude and thinner air also posed a problem for long-range flights to Asia; United’s early Transpacific fleet of 747-200s and DC-10-30s would not have been able to carry full loads nonstop, so those airplanes were used from Seattle and California instead. United’s newest generation 787-8 was the right aircraft with the high-performance engines, low weight, and appropriate capacity to handle the route, and with Star Alliance partner ANA-All Nippon generating connecting traffic in Tokyo, the daily flight is a permanent fixture in the Colorado sky. Appropriately, United is Denver’s largest airline and offers services to large and mid-sized cities across the USA. The Tokyo flight’s lunchtime arrival and departure times allow for well over 100 connecting flights. Denver is also the home base for low-cost carrier Frontier Airlines (with its famous animal-tailed jets) and a major connecting center for Southwest Airlines. American, Delta, JetBlue, Alaska, and Spirit also serve the city. The flight from Tokyo will arrive at the central section of the A concourse. After deplaning, passengers are directed up and across the skybridge from the concourse to the Jeppesen Terminal, coming out on Level 5 for passport control and then baggage claim. Passengers connecting onward may drop their bags at the United counter before heading out into the terminal. The exit from Customs is conveniently on the same level as domestic baggage claim, and for connecting passengers, the security checkpoint (and train station to get back to the gates) is just steps away. Concourse A holds the dedicated International gates, the Frontier hub operation, and gates for American, Delta, JetBlue, Sun Country, and the independent commuter carriers Boutique Air and Denver Air Connection. Passengers can also walk across a bridge from the main terminal to reach the A gates – aircraft taxi underneath! Concourse B houses United’s hub, including United Express gates. Concourse C is for Southwest , Alaska, and Spirit. Thanks to growing traffic, the airport will soon be expanding the concourses to either side to make more gates. Ultimately the tram system can be extended out to support future D and E concourses by mid-century. Full-length windows and high ceilings help the concourses avoid feeling cramped, and moving walkways run the length of each concourse to help you reach your gate quickly. Power outlets are widely available. And check for extra seating areas one level above the gates! There aren't any dedicated kids' play areas in the terminal or concourses, which seems like a missed opportunity. The concourses are long enough to get good exercise - and the bird's eye view of the airport apron from the skybridge connecting the Jeppesen Terminal to Concourse A is great entertainment. In good weather, the Rocky Mountains also make for fascinating scenery. More and more airports are bringing animals into the terminal and gate areas to help kids and grown-ups deal with stress and have happy experiences, and Denver is no exception: look for their CATS patrol (Canine Airport Therapy Squad)! If you have the time, pull up the airport's website or grab a printed guide to the artwork currently on display and take the kids on an art scavenger hunt - DEN is loaded with installations large and small, permanent and temporary. Nursing rooms are available in the center of each concourse. These are quiet spaces with sinks and changing areas, and can only be entered with a passcode. The restroom facilities at DEN are well-distributed throughout the gate areas and central concourse cores. All restrooms are handicap accessible and private, larger-space unisex/family rooms are spread throughout the facility. If you're managing more than one child, you'll want to look for those family restrooms as the stalls in the 'standard' facilities are conventionally-sized and not big enough to handle suitcases and a stroller at the same time. There are food courts in the central upper levels of each concourse, and additional dining and beverage counters scattered through the gate areas. The options include the usual fast-food and mall-based brands, and outposts of some of Denver's local restaurants if you have time for a sit-down meal. Shopping options are a mix of clothing, souvenir, newsstand, candy, and electronics. Of course, being in Colorado means plenty of outdoor gear is available (and beef jerky)! There is one toy shop, the well-stocked Kazoo & Company, on the mezzanine level of Concourse B.
Denver’s RTD system runs its A Line commuter rail trainout to DEN from downtown, in 15- to 30-minute increments. The ride takes just under 40 minutes from Union Station and costs $9. There are six stations between downtown and the airport, connecting many of the key neighborhoods on the city’s east side, as well as providing links to the R line. At Union Station, there are also links to the B, C, E, and W lines as well as Amtrak. Wi-Fi is free throughout the airport and is blazingly fast. There are no ads you need to sit through and no time limits, so it’s ideal for kids who want to stream media or play games online. A brand-new Westin full-service hotel is connected to the Jeppesen Terminal and commuter train station. Header image of Jeppesen Terminal against mountains courtesy Denver International Airport via Wikimedia Commons. At a natural crossroads for the 19th-century railways, the highways that followed, and the airways that arose after that, Atlanta’s natural resources and people were brought together by transportation to create a manufacturing, finance, education, and media center. Atlanta’s diversity is reflected in its hometown companies, such as Coca-Cola, UPS, CNN/Turner Broadcasting, and The Home Depot. Pioneer airlines Delta and Eastern developed ATL into the first true “hub” as they learned how to balance business and leisure traffic flows among the Northeast, Midwest, Florida, and the South. Short-haul and long-haul services were both within economical reach of common 20th-century aircraft thanks to Atlanta’s excellent geography. After Eastern’s collapse, Delta rapidly expanded both in the USA and overseas, finding Atlanta again to be placed ideally to balance West Coast, Transatlantic and Latin American traffic flows. Today ATL is not just a true global hub, it is the busiest airport in the world by passenger count (although Beijing is catching up quickly!) Flights to major cities are now so frequent that there is no longer “slack time” between banks of connecting flights. Low-cost carriers Southwest, Frontier, and Spirit offer substantial competition to key business and vacation centers across the US, and the major network carriers link ATL to every US hub. Service to Asia has been slow to develop, however, as Delta has better-positioned hubs to carry traffic in that direction (such as Detroit and Seattle). There are several flights: Delta’s focus city at Tokyo-Narita is served daily, and Seoul-Incheon is now served with two daily nonstops, one from Delta and the other with their joint-venture partner Korean Air. These flights allow for convenient same-day inbound connections from all across East and Southeast Asia and most major cities in China. More options from Atlanta to East Asia have opened through the Middle East with the arrival of Qatar Airways and Turkish Airlines in 2016. 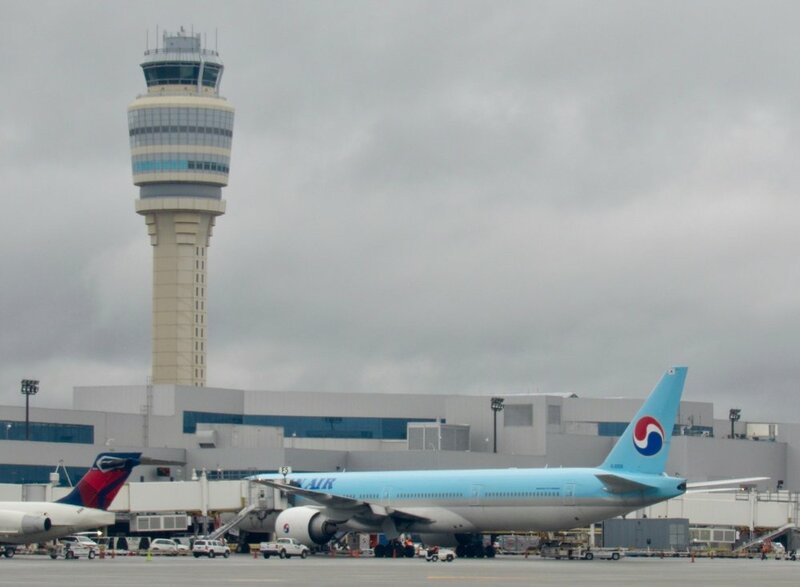 These carriers have been aggressively expanding their route networks and building new airports specifically for global connecting passengers. The walk from gates on Concourse F to passport control takes less than 5 minutes, but from Concourse E you should be prepared for 15-20 minutes (although there are moving sidewalks in the tunnel to help you along.) With 20 passport-check counters, waiting time for this step should be under 10 minutes - and baggage should be arriving at the carrousels at about the same time you do. If you have items to declare in your luggage, stop at the USCIS counter. If connecting to another flight turn left outside the baggage claim and re-check your bags at the airline counters - then proceed through the security check. Once through security, you can head up one level to Concourse F, go forward through the underground tunnel to Concourse E, or down to the tram station to ride to the other concourses. Check the row of departure information screens to figure out which direction to take. Total time from getting off your aircraft to getting back into the gate area runs 30-60 minutes, depending on which concourse you arrive at and how many other overseas flights are being processed at the same time. If you’re not flying somewhere else, turn right outside the baggage claim and follow the hallway to the lower level of the International Terminal. If people are waiting for you this is where they’ll be, and the parking ramps are directly outside. If you are planning on using Atlanta’s MARTA system, catch the shuttle bus to the Domestic Terminal where the train station is located. The concourses are linked together by an underground automated tram (the "PlaneTrain"), and all gates are in the same security zone. Tram stations are located at the middle of each concourse. It takes just over a minute to travel from one concourse to the next; figure about 10 minutes from concourse A to concourse F. The tram tunnel also includes a pedestrian walkway; this is the best way to grab extra steps if you have the time or desire. The hallways are too narrow for moving sidewalks, and there aren’t enough escalators to quickly handle the crowds at tram stations. The tram can get very tightly-packed, especially at peak times of the day. You’ll need to carry along extra patience when traveling through ATL. Having said that, the new Concourse F is better-designed all around, with a wider hallway, bigger gate areas, plenty of natural light, and comfier places to rest. If you have 2 or more hours between flights, this is the place to settle down. Compared to other major airports, ATL is sorely lacking in features to make travel less stressful for parents and more enjoyable for kids. Some of the gift shops have toys, and Panda Veranda near gate B9 has a nice selection of stuffed animals and Atlanta Zoo merchandise, but there’s no other retail in any of the concourses specifically aimed at families. ATL does feature an extensive collection of artwork of many varieties- from puppets to mosaics to sculptures, kid-created to professional - and pieces can be found throughout the complex, but especially on concourse E. If your children are old enough to enjoy the arts, this may be a good use of time. Quiet, open space can be a challenge to find, and a place for kids to run around to burn off steam is even more difficult to come by. There are no designated relaxation areas, and considering how crowded the aisles get at peak connecting times, you’ll want to keep your kids very close. As mentioned above, Concourse F is the best spot to find quiet, comfortable space if you have extended time between flights. We’ve also had good luck on Concourse E in finding empty gate areas where kids can nap or play on the carpet without getting underfoot. If you are passing between the A and B concourses underground, as part of the remodeling of the airport, a virtual "forest" has sprouted in the pedestrian tunnel connecting the two tram stops, complete with bird calls and forest noises. It's really charming! Watching the takeoffs and landings is especially enjoyable in Atlanta, for the variety of airplanes you’ll see and the constant activity - the best spots for this are at the far end of any of the concourses. There are 13 “family restrooms” in the secure gate area - 3 on concourse T; 2 on concourse A; 3 on B; 2 on C; and 2 on D. No dedicated family restrooms are located on the international concourse E, but one is on Concourse F by gate F6. The facilities have the basics - a changing table, electric outlets, a wide space around the toilet - but are on the small size compared to other airports (except for F6) and don’t have a privacy wall around the toilet. They appear to get a lot of use, so cleanliness may be an issue. Conventional restrooms are also heavily used, keeping the maintenance staff continually busy. The fixtures have recently been updated, but stall space is not big enough to hold your luggage and a child, and there is no shelving over the toilets or urinals to keep your bags up and out of the way. Both men’s and women’s restrooms do have changing tables near the sinks. ATL does manage to pack a good number and variety of food options into the gate areas. Larger food courts can be found in the central areas of concourses A, B, E and F, just outside the tram escalators. The court on E has the most variety; the seating area on B has the best close-up view of the airplanes; and F has the most space to park your family comfortably. Sit-down restaurants, fast food and coffee stands (with all the usual chains represented), and small carts are distributed evenly around the concourses. Shopping options tend to be more of the newsstand / travel goods / electronics variety, with a few cosmetics shops and bookstores. Look for Atlanta-specific gift shops if you still need to pick up some locally-sourced items for presents. ATL now has free WiFi available throughout the complex, including the PlaneTrain. Charging stations are widely available and easily spotted. MARTA’s Red and Gold lines connect ATL with several neighborhoods, including College Park, West End, Downtown, Midtown, Buckhead, Lenox, Chamblee, Dunwoody, and North Springs. Connections downtown at Five Points to the Blue and Green lines give access to the east and west halves of the city as well. In the 1970s and early 1980s, the airport at Ontario, California was a busy alternative to crowded Los Angeles International, and carriers like United, American, Western, and Continental ran mainline services to their national hubs, while regional carriers like PSA, AirCal, Hughes Airwest, and Alaska covered the West Coast. ONT was managed by the same authority as LAX, and concentrated their investment on the latter airport, first to handle the surge of traffic for the 1984 Olympics and then to manage the consolidation of the airline industry: American, United, and Delta all wanted to establish hubs there. Ontario was assigned ever-higher cost burdens to help finance development at LAX, which drove traffic away. It took until the late 1990s for ONT to get a replacement for its 1960s-era terminal, and arguments about costs and local control continued into the 2010s, when the airport authority was devolved to Ontario and San Bernardino. Since its independence from LAX at the end of 2016, Ontario Airport has been working to lower its costs and attract new flights. The “Inland Empire” was hit hard by the 2008 Great Recession, but its recovery has been strong, and its location outside the road and rail snarls of Los Angeles proper – yet on the mainline interstates and railroads - has made it an important logistics hub: both UPS and FedEx have made ONT into key facilities for all Southern California. Asian-American communities have steadily grown on the eastern side of Los Angeles, in Orange County, and on the northern side of San Diego. These communities would like (and are willing to pay for) convenient flight options to East and Southeast Asia, but Santa Ana’s airport is locked in to a short runway and limited hours which prevents long-range flights, and San Diego’s configuration is adequate only for Japan Airlines’ 787 nonstop to Tokyo – nothing bigger or with longer range. Up until this point, that meant travelers would have to endure long highway journeys to LAX. ONT, however, is convenient to the I-15 and Cal-91/Cal-60 corridors, has a very long runway, and is not subject to noise or frequency restrictions. While it may be similar road mileage from these communities versus LAX, the driving time can be literally hours better. The arrival time at Taipei will allow same-evening connections to Bangkok and Hong Kong, while the afternoon departure from TPE connects in from those two cities as well as many more from Southeast Asia and mainland China. It is expected frequency will eventually become daily on this service. China Airlines will use its Boeing 777-300 on the route. China Airlines’ SkyTeam partner, Delta, only flies to ONT from its hub in Salt Lake City, and the arrival/departure times for those flights would be terribly inconvenient to make connections (5-6 hour waits). So this flight is truly dedicated to serving local passenger and cargo customers for eastern L.A. and San Diego. International Arrivals building. Image via Google Street View. Ontario uses a dedicated, separate building for international arrivals needing Customs clearance. After landing, passengers will exit the airplane via stairs and walk outside on the apron to an enclosed walkway. Passport control is immediately inside, and then baggage claim. Passengers not needing to declare items at Customs may exit directly. Average times to clear Customs at ONT currently run 15-30 minutes; on the lower end of the range for US citizens and the higher end for non-citizens. This is based off arrivals data for Aeromexico and Volaris flights coming in from Mexican cities – with the important note that those flights are on smaller 737 and A320 aircraft. 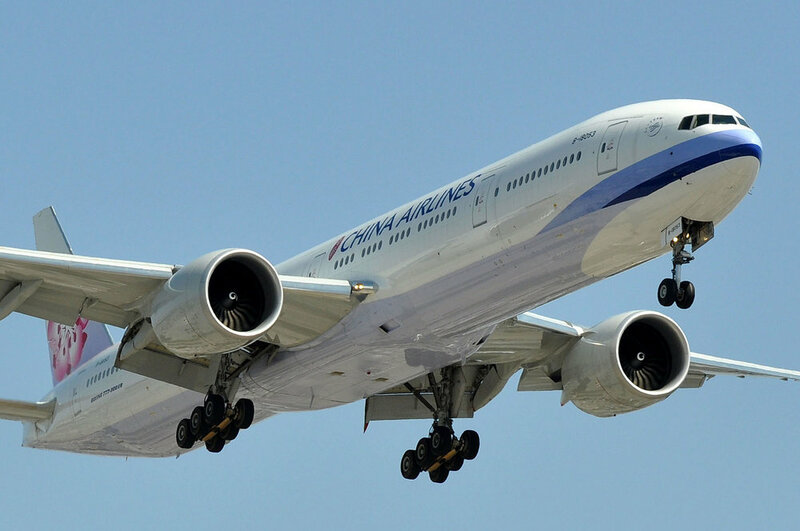 China Airlines’ 777-300 will carry about twice as many passengers, so longer processing times should be expected. No other international arrivals will be taking place when the Taipei flight comes in, so this will help; we will need to see how US CBP staffs to serve this time of day to get a real sense of processing time. 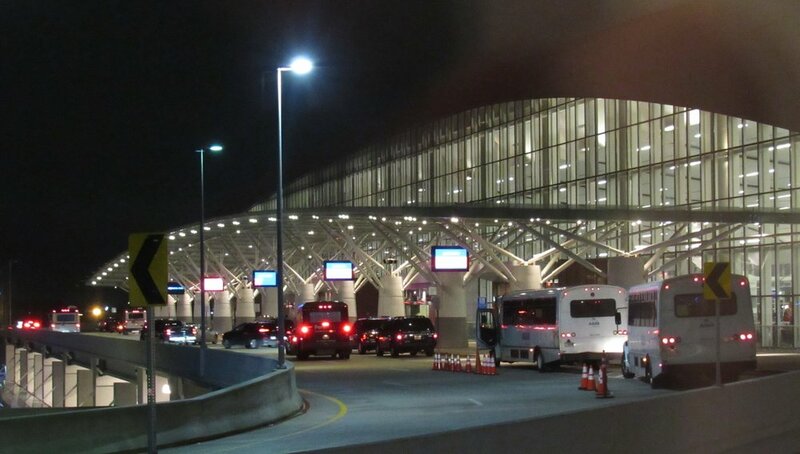 There are no baggage recheck counters at the international arrivals building, or shops, just restrooms and doors outside to catch a shuttle bus to the other terminals, parking lots, and ground transportation center. The shuttle runs every 15-20 minutes, 24 hours per day. Image via Google Maps. Click to expand view. International departures from Ontario leave from Terminal 2, and SkyTeam partners Delta and Aeromexico are also housed there. Check-in is on ground level, with the security checkpoint upstairs and gates just beyond. The terminal was built with the intention of quickly moving passengers between the airplanes and parking lot – not for spending extended time there, or for making connections – so it’s a stripped-down building with just the basics. There aren’t any play facilities or kid-oriented artworks. There is a nursing area tucked in between the women’s restroom entrance and the vending machine complex across from Gate 207. If your kids enjoy watching aircraft on the ramp and runways, the big windows do afford a good view of the action. The space just outside security gives the best panorama in Terminal 2. Terminal 2 was opened in 1998 so restrooms are up to ADA standards. There is one family-size restroom directly across from Gate 206, between the ATM and the men’s restroom entrance. At present there are only two prepared food outlets in Terminal 2 (one Mexican and one sandwich shop), plus an array of packaged-food vending machines. Likewise there is only one newsstand and one general-merchandise shop: nothing in particular oriented toward children, but more along the lines of last-minute needs, reading material, and gifts. There is space in the concourse for additional food and retail, but traffic through the building needs to dramatically increase to attract and keep more tenants. Wi-Fi is free and strong throughout the airport. ONT is situated between Metrolink’s Riverside And San Bernardino lines, but neither has a station at the airport. The local bus system, Omnitrans, offers service every 15 minutes from Terminals 2 and 4 along their route #61, which links the Pomona station on the Riverside line, and the Fontana station on the San Bernardino line. Bus route #80 with hourly service, reaches the Ontario Convention Center, Alta Loma, and Rancho Cucamonga. Houston’s historic importance as a center of energy production and logistics quickly put it on the post-World War II map of long-range flights from Europe and Latin America. Companies like Phillips 66, Conoco, Halliburton, and Occidental – and the contractors and suppliers who support them – send their people all over their world, often on short notice: they require frequent international service and are willing to pay well for it. The city’s seaport and distribution infrastructure – and closeness to Mexico and the Caribbean – also gave it more of a global outlook, cuisine, and population. 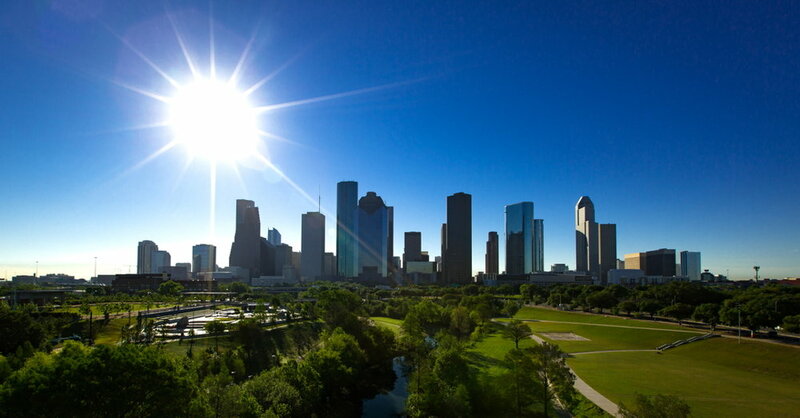 Yet it was not until after the Vietnam War and the emergence of the Four Tigers economies in the 1970s-80s when Houston started to pick up Asian influences and migration, and vibrant Vietnamese and Taiwanese communities developed in the southwest quarter of the metro area in the 1980s-90s. It took until 1998 for Houston-headquartered Continental Airlines to start nonstop service to Tokyo, the city’s first air link of any kind to Asia. From these four hub cities, nearly any point in East and Southeast Asia can be reached in just one stop. Domestically, United covers all major US cities from IAH and regional destinations in Texas, the Southwest, and the Gulf Coast. These areas, and Florida, are best-positioned to use Houston as a connecting point for flights to Asia. Delta, American, and Spirit also send numerous flights into IAH, but don’t have international partners flying there to take you to Asia via Houston. Finally, Southwest doesn’t fly to IAH at all, as they have a significant base at Hobby Airport on the south side of the city. International arrivals for the Asian carriers pull up to gates in Terminal D, where mid-level walkways and bridges direct passengers through the building, across the street, and into the central Customs checkpoint. Passengers arriving on United’s flight dock at Terminal E, where they ascend a level and walk above that concourse to get to the same central Customs area. Passport checks take place on the upper level, and then passengers go down a floor to the baggage claim and Customs inspection area. For travelers not flying onward, there are exits from this point to the arrivals area on the ground floor of Terminal E. For people connecting to other flights, turn right after Customs for baggage re-check stations and then security screening. Once through TSA screening, you will come out into a corridor linking the D and E gates, with the Skyway train station just around the corner. Click this map to open a new window for detailed maps on the airport's official site. One thing is certain when flying from or connecting through IAH: there’s almost always going to be a lot of walking. The airport opened in 1969, before the days of security checks or massive airline hub operations, so the original Terminals A and B were small, separate buildings each with four “banjo” concourses tucked in close. By the early 1980s this arrangement was clearly impossible to manage for Continental’s growing hub, so they built Terminal C further east. 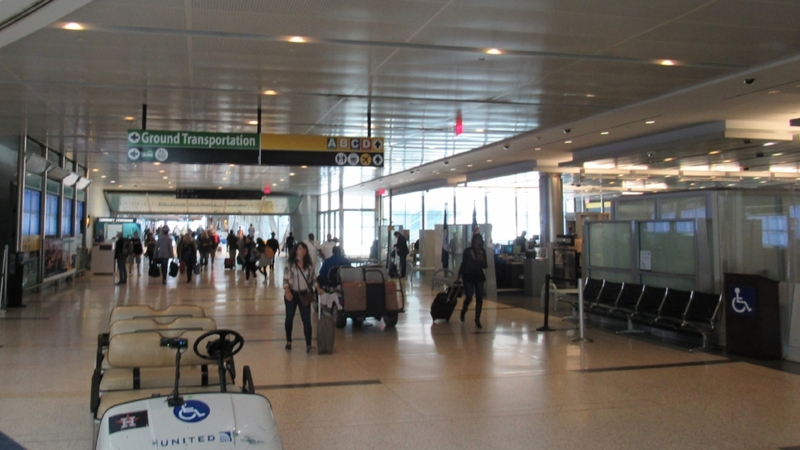 Terminal D opened in 1990, then Terminal E in 2002. In 2018, only two "banjos" remain, on the north side of Terminal B. These will get torn down in the early 2020s and replaced with more-conventional concourses. The terminals are spread so far apart because they are sitting between the airport’s east-west runways, and concourses can only extend outward by a few airplanes’ wingspans before blocking taxiways. Likewise, creating one central terminal is impossible because of how the roadways and tunnels were laid out in the 1960s. In fact, the airport has run out of room and cannot add any more terminal buildings to the east – so they have been progressively re-constructing the terminals and gate areas to become more efficient. IAH is about halfway through that process, and it will take well into the 2020s for all its parts to be rebuilt. United’s operation in Houston is so large that it now uses all the B, C, and E gates, and many of the northern A gates as well. Delta, American, Spirit, Air Canada, Alaska, Frontier, and other US and Canadian carriers use gates in the A complex, while all the overseas and Mexican carriers use the D gates. So even for a United-United connection it is entirely possible you may arrive at gate A1 and depart from gate E19. Thankfully, all gates can be reached without having to leave the secure area. Skyway shuttle trains run along the north side of the complex, with one station in Terminal A, B, and C, and a station between Terminals D and E. These trains are quick and frequent and afford a pretty good view of the runways and ramp on the north half of the airport. From one end to the other is about a 5-minute ride. However, even using the Skyway train, there is still considerable walking needed along the C and E gates. And if you are using United Express service leaving from the B gates (especially B1-B31), those are also a long walk from the Skyway station. For domestic-domestic, or domestic-international connections, we would advise using no less than a full hour and preferably 90 minutes between flights. The one case where you won’t have too far to walk is if you are being dropped off on the ground floor of Terminal D to check in for your flight – in that case the gates are immediately above the ticket counters and security checkpoint. IAH has no children’s play areas and no consistent safe stretches of space where kids can run around to burn off steam while waiting for boarding. Even open gate areas in the C14-C15 or D1-2-3 stretches will see a steady stream of cart traffic and just enough people trying to sleep to keep them “no fly zones” for children. The international gates east of the small food court, D7 – D12, have several interesting child-height art installations and occasionally someone playing the grand piano. Mindworks, near gate E9, is a small but well-stocked kids’ shop with toys and aerospace / NASA gear; well worth a visit if you are in the E gates or even the C30-C40 area. Surprisingly missing is any exhibit from NASA/Johnson Space Center – in contrast to the two locations Kennedy Space Center has in the Orlando terminal. There is plenty of open-air space in the E gates, the C-North gates, and the ticket hall of Terminal D for them to mount full-sized spacecraft replicas! Just as the gate areas are being progressively torn down and rebuilt, so are the restrooms. The newest parts of the complex (A-gates, E-gates, B1-B31 United Express holdroom, and the C-North gates) have been built with conveniently-located family restrooms. The restrooms in the international D-gate areas are adequate in periods of average traffic, but starting to show their age and not up to the same standard as the ones in the E-gates, plus there are no family facilities in that stretch. This could lead to long waits if several flights are leaving around the same time. Typical stall in the E-gates; note the small shelf above the toilet for storage. Restroom repair and cleanliness is also uneven across the terminals – the newest are simply built better for the traffic they get, so they are easier to maintain. Thankfully, great food options for any palate or food requirement are available throughout the complex, and since you’ll be walking anyway, you’ll get to see a wide spectrum of choices. The local cuisines of East Texas and the Gulf are well-represented, from steakhouse to Tex-Mex, Cajun/Creole, Vietnamese, and seafood. National chains are well-represented, and the airport is rolling out many sit-down restaurants that use the popular order-from-iPad service format. There are also several shops to pick up fresh fruit and deli sandwiches. Shopping options include the usual newsstand, electronics, cosmetics, sunglasses, and luxury-goods choices, but you’ll also find more than the usual number of clothing stores. IAH is piloting an interesting twist to shopping: certain merchants will let you use your MileagePlus points toward payment! Houston has a metro rail system, but has not extended it out to IAH – it might get there by 2035, according to the latest long-range plan. There is a bus route to downtown, but it does not go near the Convention Center or main bank of hotels. SuperShuttle, taxi, or private car are the only realistic options for fast ground transport. If you need to stay overnight before or after your trip, the Houston Airport Marriott is located between Terminals B and C, and can be reached from any terminal via underground Subway (catch it on level LL below baggage-claim). Many rooms have a good view of the ramp! For its convenient location, it does claim a premium price. Lower-priced national chain locations with family-friendly amenities and free shuttles to IAH would include the Spring Hill Suites by Marriott, DoubleTree by Hilton, Country Inn & Suites, La Quinta Inn, Hampton Inn, and Courtyard by Marriott. This traditional Pacific port of entry is easy to use. Seattle’s historic ties of trade with and immigration from Asia, its many technology and service companies, and its relatively short flying times have attracted many airlines to start Transpacific service here. Delta Airlines has built up a strong Asian operation out of Seattle with nonstops to Beijing, Hong Kong, Seoul-Incheon, Shanghai-Pudong, and Tokyo-Narita. Fellow SkyTeam carrier Xiamen Air has started a 3-per-week service from Seattle nonstop to Shenzhen in the Pearl River Valley, continuing on to Xiamen on China's southeast coast. ANA - All Nippon Airways, in the Star Alliance with United, has a daily nonstop to their big Tokyo-Narita hub; many Southeast Asian cities can be reached same-day. Asiana Airlines - in the Star Alliance with United - runs a 5-per-week nonstop to Seoul-Incheon. A few interior Chinese cities can be reached same-day; otherwise an overnight stay is needed. Hainan Airlines, an independent Chinese carrier, flies nonstop 5 times a week to Beijing, where they offer excellent same-day connections to many interior cities. They have also started a 3-per-week nonstop to Shanghai-Pudong. EVA Airways flies daily nonstop to Taipei. Airlines from Taiwan have only recently been allowed to fly into mainland China; your best connections on EVA are to Fujian and Guangdong provinces. The return flight into Seattle arrives too late in the evening to make same-day onward flights, and the departure from Seattle leaves well after midnight. Domestically, Seattle is the headquarters and main hub for Alaska Airlines and their commuter arm, Alaska Horizon, as well as a major base for Delta, who has its own commuter services too. Sea-Tac is also an important focus city for United. These networks link Seattle to every major city in the Pacific and Alaska time zones, and every second-tier city in the Pacific Northwest. Every major US airline serves SEA, including the low-cost carriers Southwest, JetBlue, and Spirit. No matter which frequent-flyer program you’re on, or part of the country you’re from, you’ll have numerous options. The Sea-Tac complex uses an X-shaped layout: Concourses A and B extend south of the central terminal, while Concourses C and D run north. There are two satellite gate areas, South and North. Image courtesy Port of Seattle. Click on image to see more about the expansion project. Thanks to robust growth of international service, Concourse A and the South Satellite are being linked by a skybridge, and a number of A-gates will be able to handle overseas arrivals. The North Satellite is also being expanded to handle Alaska Airlines' hearty growth. Concourse A houses United, Air Canada, and Sun Country, as well as many Delta flights. On Concourse B you’ll find Southwest, Spirit, and Frontier, and also Delta. Concourses C and D are the heart of Alaska’s hub operation, as well as the North Satellite. American and JetBlue also run out of Concourse D. The South Satellite is Delta territory. While Sea-Tac is spread out, walking times are quite short thanks to three underground tram lines, all inside the security zone. Using the trams, you can move from the South Satellite to the North Satellite in less than 15 minutes. Concourse A is the longest, but has been equipped with moving sidewalks for speedy transit. The entire complex has been freshly renovated with wide corridors, expansive windows, and engaging art. On clear days you can see the Cascade Mountains and islands in Puget Sound. Even on overcast days the terminal is filled with natural light. A large play area is located between the central food court and the beginning of the A-Concourse. There’s also plenty of seating for parents, too. If you have several hours between flights, and children who want to stretch their legs, the far end of the A-Concourse (gates A11-A14) has great views on a sunny day, and you can often have the entire area to yourselves. 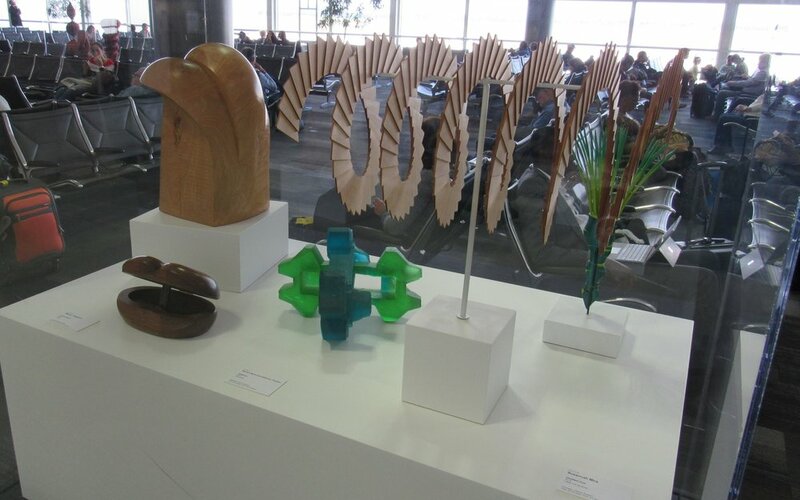 Local artwork permeates the terminal, often with an aviation or Native American theme, giving great opportunities for kids to ask questions, look for patterns, and inspire their own creativity. The Pacific Northwest music scene also resonates at Sea-Tac as they have created an ambient music stream for the terminal featuring local artists. Another semi-secret gem is the Atrium at the south end of the ticketing counters. This area is outside security (so you’ll need to be screened again to get to your flight), but the open space, rocks to clamber over, and seating outside for fresh air are worth a visit if you have time. Several family restrooms are available on every concourse and satellite. In addition, the stalls in regular restrooms incorporate several sturdy coathooks, plus a shelf above the toilet, making it much easier to manage your cargo and children. Cleanliness is very good, and the facilities are uniformly in excellent condition. For the most diverse selection of gifts, a good-sized bookshop, numerous sit-down restaurants, and additional fast-food options, go to the central food court, where all four concourses converge and the view is amazing. There are several shops here with kids’ sections, as well, including the awesome Planewear - gear, gadgets, and gifts all about aviation! WiFi is available throughout the terminal and gate areas at no charge!